The last decade has witnessed growing importance of non-bank funding sources for Indian corporate sector. Over the same time, Indian banking industry has been crippled by the ever-rising Non-Performing Assets (NPAs), which has reduced the effective supply of bank credit. The aim of this study is to understand the link between these two developments. In particular, it is shown that the stress in the banking sector has prompted non-financial firms to tap non-bank debt sources. It is found that small and medium-scale firms with good financial health are more likely to substitute bank credit with non-bank credit in response to the banking stress. The evidence also suggests that amongst the firms with poor financial condition, relatively smaller firms are effectively rationed out of the credit markets. Indian banking sector is facing the problem of growing Non-Performing Assets (NPAs). From 2014 to 2017, the average level of NPA to advances ratio across public-sector banks has almost doubled from 5 per cent to 10 per cent. Rising NPA levels have curtailed the supply of bank credit as banks are rebuilding capital or keeping aside larger share of loanable funds against future possible losses. In parallel, Indian financial markets have witnessed a significant development of non-bank sources of credit such as corporate bonds, External Commercial Borrowings (ECBs) and Commercial Papers (CP). Greenspan (2000) referred to bond market as "Spare Tyre" of the credit market, which keeps the economy running when banking system breaks down. The objective of this research memo is to understand if the Indian non-bank credit market has acted as a “Spare Tyre” for our economy or not. More precisely, this study aims to find whether the Indian corporates have shifted towards non-bank credit sources in response to stress in the banking sector and if they did, then what type of firms were able to access the alternative sources of funding. In 2005, Indian non-financial firms raised roughly 80% of the new debt funding from banking institutions. But the relative importance of bank credit as a source of funding for non-financial firms has reduced dramatically over the last decade. Chart 1 shows the fresh debt raised by firms from various funding sources. In 2016, non-bank debt through corporate bonds, CPs, and ECBs accounted for more than half of the new debt funding. The share of new non-bank credit to total new debt has risen steadily from around 20% in 2015 to around 53% in 2016. Indian corporates utilized ECBs heavily until 2012. Depreciation of Indian currency against USD in 2013 prompted the Indian corporates to substitute ECBs with domestic corporate bonds. CP issuances now constitute a significant segment and represent roughly 25 per cent of non-bank credit.2 This implies that in the context of growing financing needs in the economy, the importance of non-bank credit is also rising. The firm-level balance sheet data for the financial years 2005-06 to 2015-16 is sourced from Prowess database of the Centre of Monitoring Indian Economy (CMIE). The database contains information on sources of funds, size of the firms measured by assets, lead bank associated with a firm, profitability ratios, and industry classification amongst other variables. The health of the firm's lead bank is measured by its NPA ratio defined as the ratio of Gross NPAs divided by Total Advances. Large firms can access non-bank funding with relative ease. At the same time, large firms tend to have stronger banking relationships. To test if small and large firms are affected differently due to banking stress, we include the interaction term between NPA and firm size. The results are presented in Table 1. Columns 1 and 2 cover the entire sample, while columns 3 and 4 pertain to the split sample, based on the interest coverage ratio (ICR) which proxies the financial health of the firm. Interestingly, poor financial health can curtail non-bank funding access for smaller firms much more severely than the large firms. 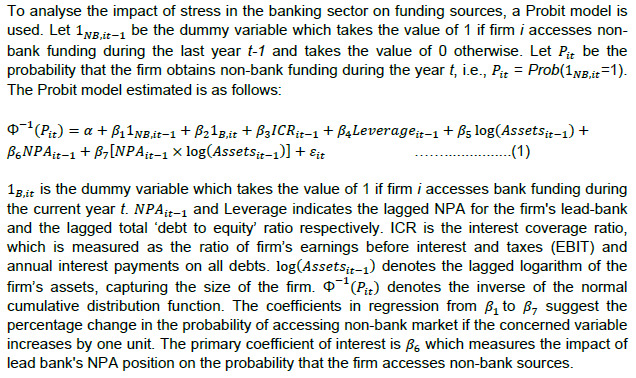 Hence, I include the NPA and firm’s size interaction even when I split the sample based on ICR. To account for the fact that overall funding needs in the economy are time-varying, time-fixed effects in regression are included. The table presents the results from probit estimation of equation 2. The estimation is carried using Pooled OLS methodology and all the models include year and industry ﬁxed effects. The standard errors are clustered at ﬁrm level. ***, ** and * indicates signiﬁcance at 10%, 5% and 1% level respectively. Impact of Firm Size: Column 2 shows that larger firms are unconditionally more likely to access the non-bank market (β5=0.257). This squares well with the narrative that large corporations dominate bond and CP market. Similar to column 1, the coefficient of Bank NPA is positive, suggesting active substitution of bank credit due to banking stress. But more interesting is the coefficient on the interaction between NPA and firm size, which is negative, indicating that larger firms are less likely to shift to non-bank funding in response to the stress in the banking system. There are two possible explanations for this rather unexpected result. First is the evergreening effect, whereby, banks rollover the credit to large firms since it would entail making large provisions. Second explanation is that a banking relationship with large borrower is valuable and hence banks strive hard to maintain it by supplying credit even in times where the bank is capital constrained. The upshot of this process is that it effectively rations out smaller firms with poor financial health from the bank market. Impact of Firm's Financial Health: ICR measures how comfortably a firm can service its debt payments out of its earnings. ICR and credit ratings are highly correlated and hence it is a good measure of firm’s credit risk. In columns 3 to 5, we re-estimate the model of column 2 but separately on firms with varying degree of financial health. The coefficient on lead-bank NPA is positive for medium and high ICR firms in columns 4 and 5 but loses its statistical significance for low ICR firms in column 3. This indicates that only small and medium sized firms with high credit quality are significantly more likely to tap the non-bank sources in response to banking stress. Inefficiency of Non-Bank Market: One result that deserves discussion is that larger firms can tap non-bank funding sources irrespective of the ICR. The coefficient on log assets is positive in all the models, and it drops a bit for low ICR firms from 0.257 to 0.186 but is still economically large. This points to a potential non-bank market inefficiency in that non-bank market is providing credit on average to firms with poor financial health that are likely to be rationed out by the banking sector. Importance of Time Effects: As chart 1 shows, there has been a significant rise in the relative share of non-bank Credit funding. Time-dummies or time effects in the regression absorb this trend, making the results comparable over time. Hence, the coefficient on bank NPAs shows the substitution in response to banking stress and not due to general shift towards non-bank sources observed over last few years. Time effects also control for the demonetisation effects, if any. More importantly, the results are obtained using a reasonably long sample from 2005 to 2017, suggesting that they provide a good description of the corporate behaviour over the last decade. The results indicate that corporate bond, ECB and CP market have allowed at least a subset of firms to diversify their funding sources. 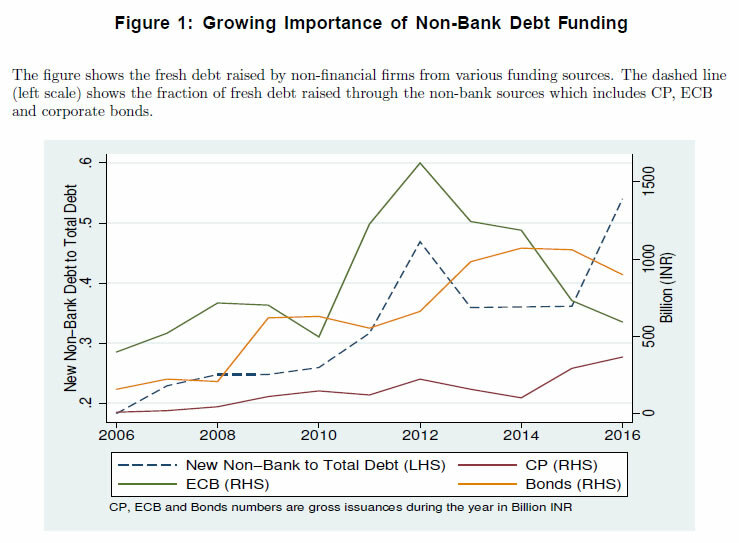 The ability to substitute the sources of financing is important to shield the economy from adverse real effects of a financial crisis (Uhlig, 2015). Small and medium-scale firms in India with sound financial health have indeed shifted to non-bank funding through bonds and CP market more aggressively in response to the banking stress. Results also indicate that larger firms have the ability to access the market in spite of having poor financial conditions. This leaves the subset of small firms with poor financials in a vulnerable situation. Current policy is focussed on debt recoveries from larger borrowers. The results indicate that bolstering the funding sources for efficient but liquidity crunched small and medium-scale enterprises is also likely to be important in arresting the next wave of NPAs. 1 Dr. Apoorva Javadekar is a Research Director at CAFRAL (Centre for Advanced Financial Research and Learning). The findings and views in this paper are entirely those of the authors and should not necessarily be interpreted as the official views of Reserve Bank of India. Author is thankful to Dr. Anand Srinivasan for valuable comments and to Khushboo Khandelwal, Sumedha Rai, Anushka Mitra, Visha Vishe and Sudipta Ghosh for research support. 3 In the sample, only 8.8 per cent of the firms access non-bank sources in a given year. Hence, 2.2 per cent increase is economically significant suggesting that almost 25 per cent more firms would access the non-bank market for funding if their lead bank’s NPA ratio increases by 1% point. 1. Businessworld (2017). How NPA of banks increased over last five years. BW Businessworld. 2. Greenspan, A. (2000). Global challenges. Remarks at the Financial Crisis Conference, Council on Foreign Relations, New York, 12 July. 3. Uhlig, H. and De Fiore, F. (2015). Corporate debt structure and the financial crisis. Journal of Money, Credit and Banking, 47(8).